Essays must be typed, double-space in English. 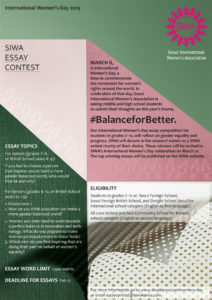 They can be submitted by email to essaycontest@siwakorea.com​. They must include the student’s name, school, grade, email address and phone number. Essays will be accepted until February 15, 2019 and winners will be announced in March 2019. Essays must be students’ own work. Plagiarized essays will be disqualified and not eligible for prizes. No exceptions. ● 1st Place (junior) – 300,000 KRW to be donated to a SIWA-vetted Korean charity of the winner’s choice & essay published on SIWA website; certificate of recognition presented at SIWA celebration. ● 1st Place (senior) -500,000 KRW prize to be donated to a SIWA-vetted Korean charity of the winner’s choice & essay published on SIWA website; certificate of recognition presented at SIWA celebration.